People enjoy the concrete floor of the Rio San Gabriel riverbed for many purposes. 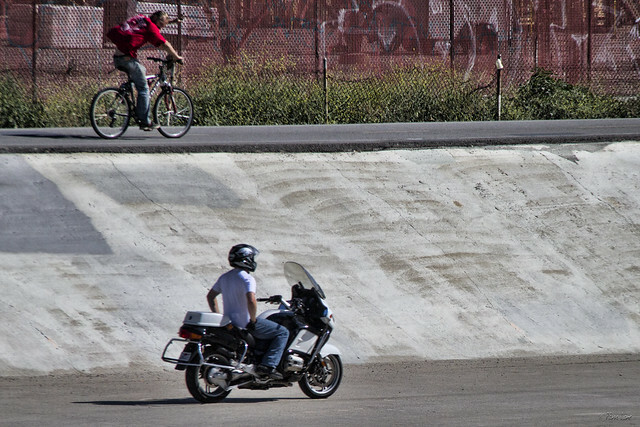 There are always skateboarders and bicyclists testing their skills on the dips and steep sides. I've seen dog owners playing fetch, and I've seen the occasional horseback rider. 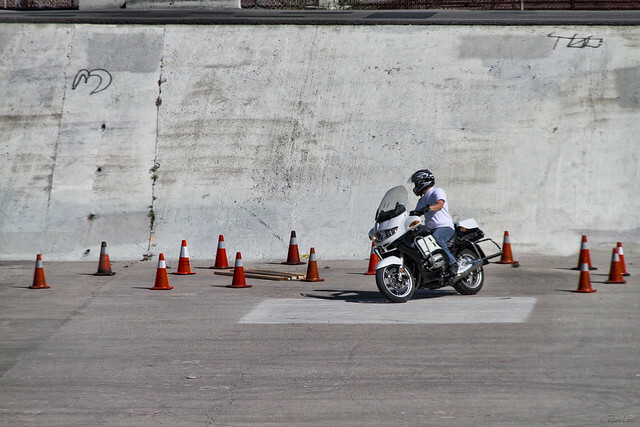 But this was the first time I've seen the floor of the riverbed being used as a motorcycle maneuverability course. This biker was practicing his sharp turns at fairly high speed. I didn't see him touch a single cone. And to finish things off, he paced a biker down the riverbed for a ways. I remember most of the rivers in Southern California around Bellflower and Long Beach being concrete. Where I live now, the Salinas River is also dry most of the time, but one is more likely to see people and dogs walking in the sand, since it's a natural river. We see dune buggies and such down there occasionally, but not too many on bikes. Barbara, I don't know if you remember it, but there is a section a little further north that is not all concrete. It's bushy and hard to walk in, but it's definitely prettier. Typically, dog owners let their dogs run loose in this area.